The year I decided to become my own best friend, was the year people in my world seemed to scatter to the far corners of the earth, my husband became consumed in his work, new friends in town were busy, old friends were occupied with their lives, so that left me with myself. Now, I had always thought I was comfortable being alone – after all, I grew up an only child, I knew how to entertain myself. I would draw, or dance, or ride my bike. As an adult, I noticed I filled my time with similar activities – going for a hike, writing in my journal, doing yoga, cleaning. And yet, I didn’t just “hang out” with myself. I didn’t know how to hang out and let the moments unfold. I usually had a plan, and for much of my adult life, I crammed my weekends full of activities – meeting friends for dinner, going to shows, having coffee at new places in town. I couldn’t quite put my finger on it, but something in my relationship with myself was missing. I’d spent a good portion of life morphing into what I thought other people wanted me to be. I was a consummate chameleon, making sure not to offend anyone, saying the right thing, stuffing my true opinions back inside if they were controversial. I had a hard time standing in my own center, because, in truth, I don’t think I knew myself THAT well. I’d been a people pleaser, and had gotten so many accolades from pleasing others, that my ego latched onto that strategy for a long time. Until I declared that I wanted to become my own best friend. When I set that intention on New Year’s Day I thought it was a lovely, supportive heart-warming and kind intention. Who wouldn’t want to become their own best friend? Little did I know I’d have to travel through some dark alley-ways of myself to integrate the bits I had dispossessed. I would have to retrieve aspects of myself that were hard to acknowledge, feel and bear witness to. I’m talking about those bits that came in the form of anger, jealousy, resentment, judgmental-ness, shame, blame, anger and grief. There were the happy places I’d also get to know more deeply – the joyful, ecstatic, fun, playful, risk-taking, active parts of me that were pleasurable to feel and acknowledge. Prior to my stating my intention of becoming my own best friend, I thought I was “living the dream.” I had a husband who loved me, I lived in a gorgeous house on a park in Spokane, WA with two dogs and a cat, our furry family. I had great friends, loving parents, good health, skills to do many different things. I had resources to travel the world. The world WAS my oyster. Something was missing….some deep inner contentment. I could feel how I was dissatisfied with my life, even though it presented so well. All the boxes checked off. I noticed how I wanted more of my husband’s attention, I took it personally when friends didn’t call me back in what I thought was a reasonable amount of time. I noticed how I didn’t feel like my teaching career had bloomed into what my vision for it had been. Deep down inside, I felt a bit like a looser. It was so hard to put my finger on. Somewhere inside, I didn’t value myself. I kept myself running around at such a high speed that I never had to feel the feelings of unworthiness, sadness, insecurity. Without knowing it, I chased the words “You’re so amazing, Diane,” which I often heard from people and it was like a line of cocaine (something I never actually tried!) The “hit” of praise kept me running to the next activity to prove how great I was – for one more moment. It was exhausting. I was chasing my ego from here to there, running this way and that way to hear those words. So, in the first 6 months of 2014, I was literally left with myself. No one was available to distract me and that’s when I turned back to my art practice. I’d been an artist all of my life, but had put it on hold for a good decade as I dove into studies of yoga and meditation. Slowly, through the art process, I began to witness my patterns of thought – I’d notice how the inner critic came out to tell me what a crappy artist I was because I couldn’t draw well. I noticed how I loved the beginning part of making a painting – that free, fun zone where you’re throwing paint on a canvas to get texture and color down. But then, when something emerged on the canvas that I liked, I’d freeze, afraid I’d mess it up. Sometimes, paintings sat in my studio for 6 months, ½ finished because I was paralyzed to take them any further. What I began to see as the dominant pattern in my life is that I was not in charge of my own life. It felt more like I was in a little dingy, out at sea, floating along with the waves that moved me this way and that. I was in a completely receptive mode, accepting whatever came my way, instead of making things happen. Now, this is a longer conversation, because life is a dance, and we need both the ability to “make things happen” while also “allowing things to occur.” Just like we can’t live on the inhale alone, or the exhale, we can’t always “make things happen” in the way we want, nor can we allow our lives to simply float by without giving it direction. Painting, alongside art journaling, became not only my refuge, but my way of understanding myself, my life and my mission. I can say now, five years later, I AM my own best friend. I have traveled through every emotion I listed above, and have investigated the root of those emotions. I’ve felt them, written about them, done art around them. I’ve used my journal as a way to deeply explore my inner world as a study of humanity. We ALL have these emotions at some point in life, the question is HOW do we acknowledge them, process them and finally integrate them? 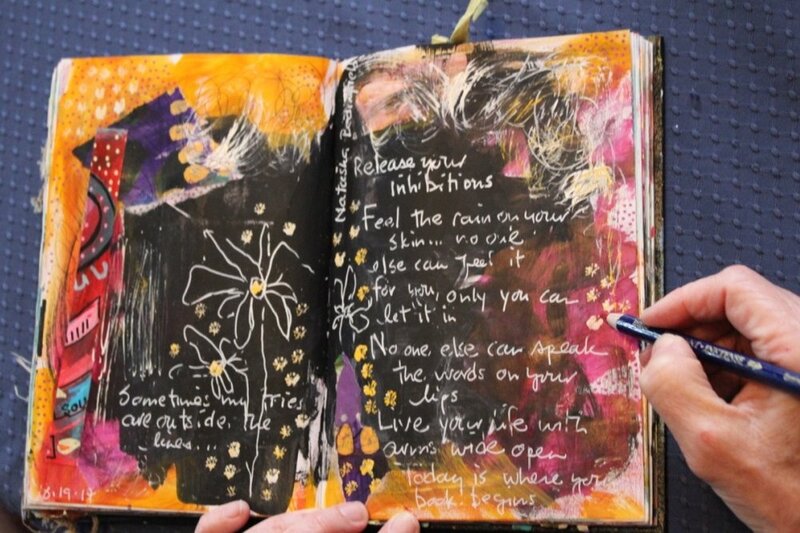 I have found art journaling an amazing way to creatively process our lives, while developing art skills and developing confidence in our own choices. We are all here to experience this life in human form, and yet our purpose and reasons for being here are unique to each individual. We are not here to live the same lives as our friends or family, and we need a way to discover our uniqueness and VALUE who WE are rather than comparing ourselves to one another. We need to learn to celebrate ourselves, to learn to write love letters to ourselves. We must learn to BE the solace for ourselves in life, because in the end, everything outside of us will leave – people will move away, they will die, jobs will end, our health will change, our energy level will diminish with age. It is the natural process of life. So, in the face of finding our own center and our own answers in life, we must find the ways to nurture our inner child, to develop our strong adult, to invite all aspects of ourselves to come to the table to take part in this thing we call life. 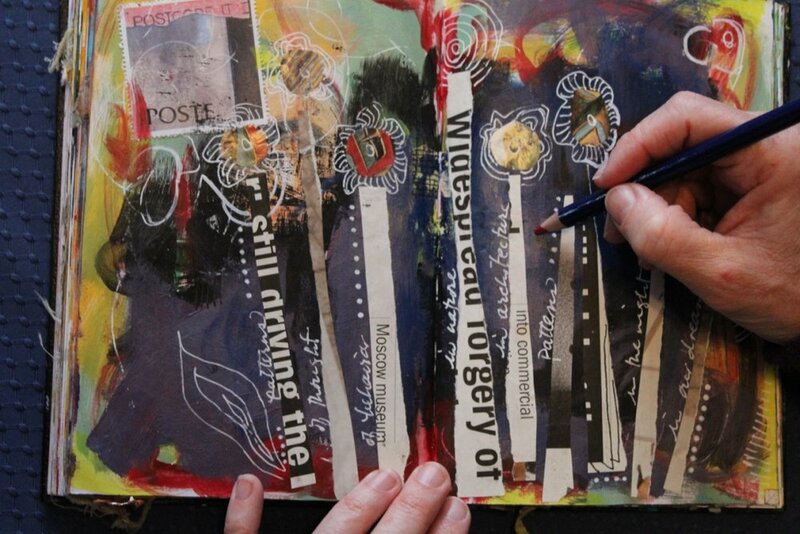 For me the art journal has been, and is my way to love myself. I have learned to love my bright shining light, my broken heart, my scared little girl, my powerful warrior. I have learned to love the incredibly creative soul I am, my curious nature, my ability to sit with you in your joy and despair. I have truly, learned to love myself. As I am. I have learned to simply accept and love who I am, as I am right here and now.